West Papua independence leader Benny Wenda embarked on his second trip to South Africa in November, to continue his drive to build support for the self-determination for the people of West Papua. Benny met with both existing supporters and new friends to discuss the progress the campaign had made since his first tour in February, and to thank South Africa for the “strength and genuine solidarity…to take back to my people in West Papua”. On his first historical two week tour across South Africa earlier in the year, he met with many people from across South African society including civil society leader Archbishop Emeritus Desmond Tutu, Chief Mandla Mandela, delegates from the ANC and Pan-African Congress, university students, organisations and others from the South African community. 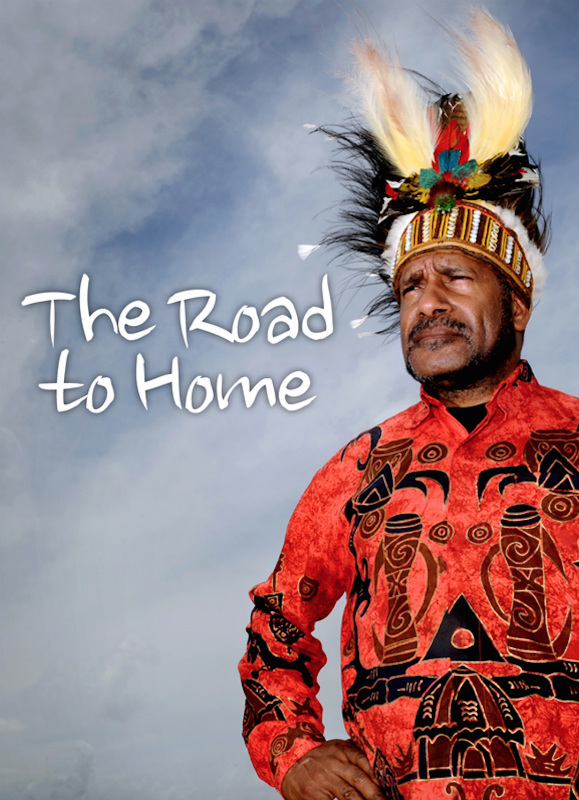 The people embraced the West Papuan struggle as their own and the tour was deemed as one of the most important trips in Mr Wendas recent history and has confirmed that with Africa’s support, The Free West Papua Campaign is getting stronger. Since the tour in February, there has been some incredible developments for West Papua on the global stage. In August this year West Papua was granted “observer status” in the Pacific regional body, the ‘Melanesian Spearhead Group’. Meaning, West Papua is actually being recognised as a “country in waiting”. Another recent step forward was Pacific leaders have requested a fact-finding mission to West Papua, awaiting Indonesia’s consent, AND West Papua was finally officially addressed at the most recent UN convention in New York in an act of courage by both the Tongan, and Solomon Islands Prime Ministers. The first reunion of Benny’s return trip was with one of our most honoured friends and supporters, Archbishop Emeritus Desmond Tutu. Benny Wenda and Archbishop Tutu. 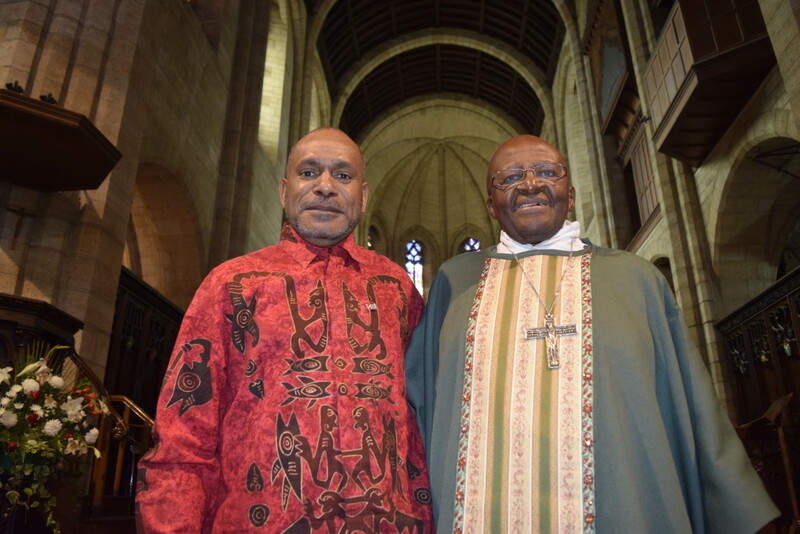 The Archbishop was happy to hear of the progress since he last met with Benny, especially of the courage felt by many of the church leaders across West Papua and the Pacific who have since seeing the images of Tutu and Benny, started speaking out against the oppression. It was especially good to see that he was back on his feet after being poorly recently. Archbishop Tutu remains one the campaigns most celebrated supporters and Benny wished him many more years of good health and happiness and thanked him again on behalf of the people of West Papua and the Free West Papua Campaign. 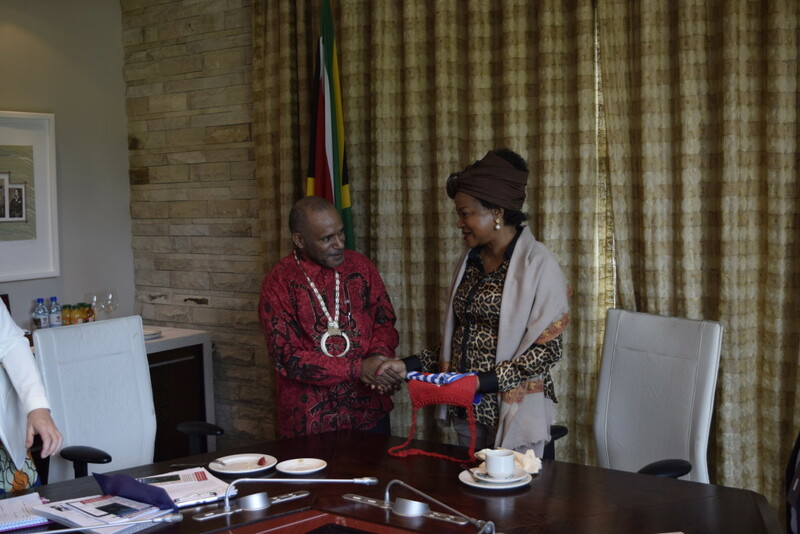 On the first day, another major meeting took place as Benny and delegation were welcomed back in to parliament to meet Chairperson of the ANC and Speaker of the House, Madam Baleka Mbete. Benny briefly met with Madam Speaker in February and was very pleased to be welcomed back to discuss the situation in West Papua. Benny shared his own story and updated the speaker on the political developments since they last met. Madam Speaker remained concerned at the situation, and said “The struggle will always continue, when you have truth on your side”. 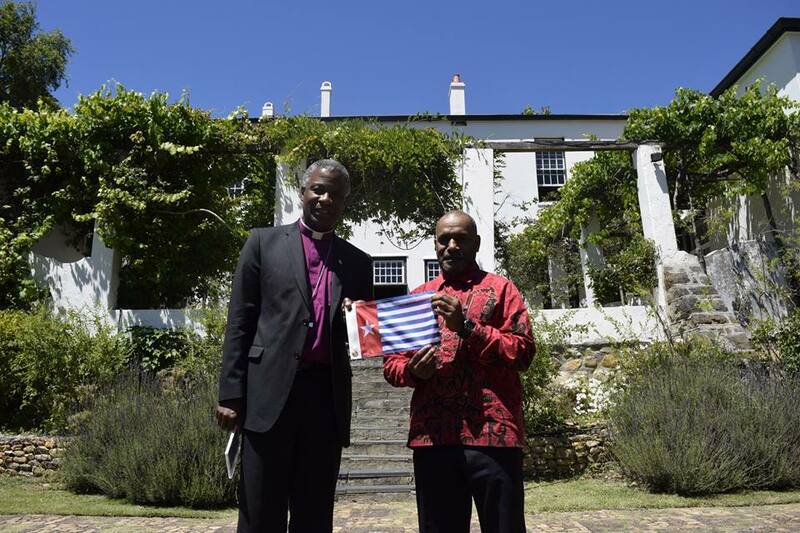 Next Benny met with current Archbishop, Thabo Cecil Makgoba, at his residence in Cape Town. Archbishop Makgoba is the engaging and outspoken leader of the Anglican Church for South Africa, the same position Tutu once held. The meeting was the first time, like many, that he had heard the brutal truth of the situation in West Papua. He offered genuine concern and support, as well as the prayers and promise of helping to spread the word through his church. The meeting was concluded by an incredible moment in West Papuan history as Benny and the Archbishop stood at the exact spot where Mandela stood when he was released from prison in 1994 to address his followers and friends of the ANC for the first time as a free man. One person that would have been standing next to Mandela on that celebrated day was Mr Ahmed Kathrada, anti-apartheid activist, Mandela’s prison mate and close friend. Mr Kathrada spent 18 of his 26 years in prison on Robben Island with Mandela, and in 1994, in the new democratic South African government, he was elected to the South African Parliament and served as President Mandela’s Parliamentary Counsellor. 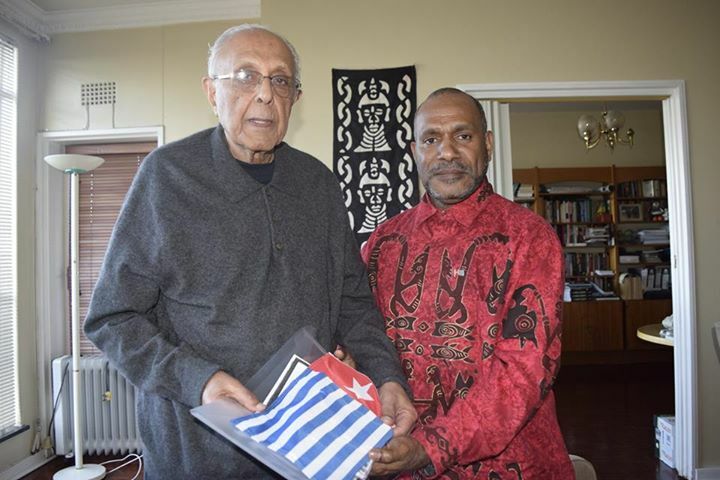 He is celebrated today across South Africa for his exemplary leadership around the world working towards freedom, non-racialism and democracy and at the bright age of 86 he welcomed Benny in to his home in Johannesburg, to share tales and again to hear about the struggle that still exists in West Papua today. The Free West Papua Campaign has made another great friend and advocate for the freedom and self-determination of West Papua. The Free West Papua Campaign had an opportunity to meet too with our most valued Cape Town Solidarity Group who have been tirelessly organising actions through the year. In one of the most intimate and special highlights of the tour Benny finally met with Rev Xola Skosana and his congregation at the Way of Life Church. Reverend Skosana has been very active in the Cape Town solidarity group and he and Benny spoke like old friends. One by one the members of the congregation stood up to offer words of support and questions for Benny and hours were spent in conversation with some of the local students. Afterwards Benny said “this is exactly what makes me feel so at home when visiting South Africa, and we must come back to see our family again soon”. 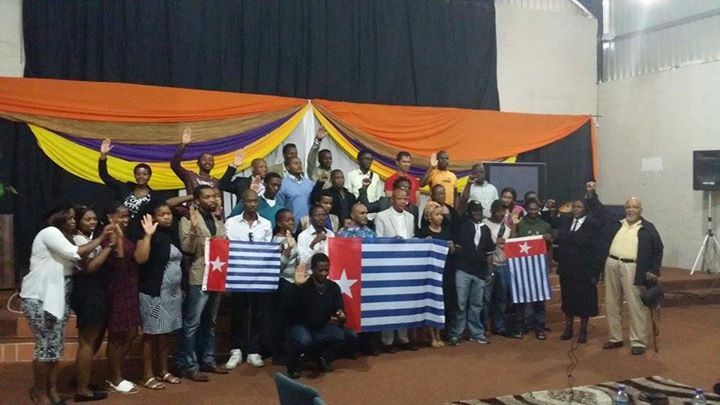 Thank you very much to the Cape Town Solidarity Group for continued efforts to keep the West Papua fire burning. Other valued support groups we managed to see on our trip were Equal Education who’s students excitedly welcomed freedom fighter Benny back and offered ideas how they can continue to support the Free West Papua Campaign in South Africa. In Johannesburg Benny was interviewed again on SABC24 news and met with human rights experts from The Legal Resource Centre, South Africa Litigation Centre, and a delegation from the Thabo Mbeki Foundation, who have all offered support and advice on how to bring a peaceful transition to democracy in West Papua, as the anti-apartheid movement once did, for South Africa. We thank the people of South Africa for their continued support.